Home/Alarm.com, DTC News/How Do I Get Alarm.com? It’s Easy! Want an Alarm.com-powered smart home security system but not sure how to get it? It’s easy. Here’s everything you need to know, in a quick FAQ format. Looking for smart business security instead? Click here. Is Alarm.com a home security company? 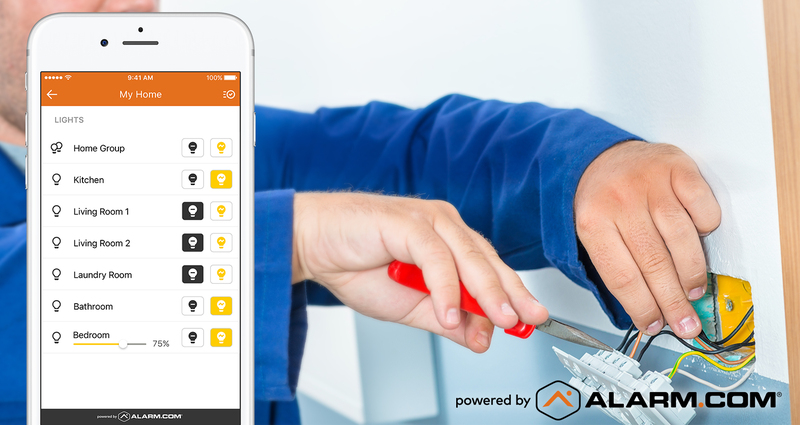 We’re the leading technology brand that invented smart home security. We’re known and trusted by millions. 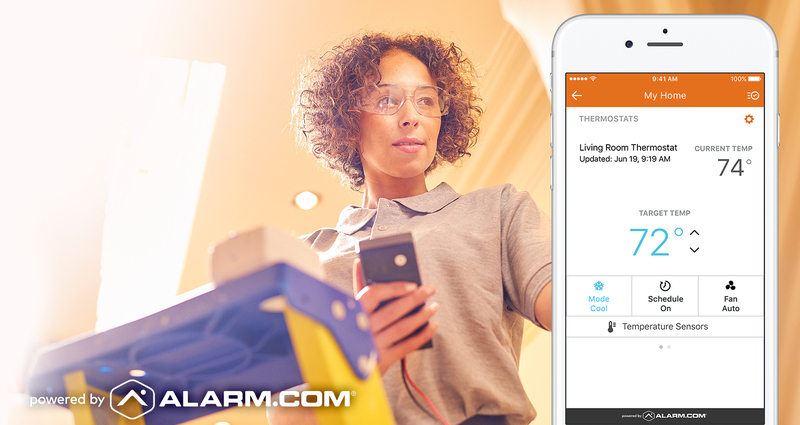 We build the Alarm.com app that controls the security system, the smart features that protect your family and keep you connected, and the intelligent platform that secures and automates your smart home. When you buy smart home security, Alarm.com technology is an essential part of the package. But we don’t sell directly to homeowners. That’s what our service provider partners do. Our service providers include some of the biggest home security brands, as well as thousands of local security dealers. To get connected with a service provider near you, click here. Why are service providers the only way to get Alarm.com? It’s because home security is a job for professionals. Smart technology is essential, but it’s not the whole picture. Your security system should be customized for your home, and installed reliably. It needs to be configured and tested, then supported and serviced over the long term, so that when you need it, it works. Our service providers do all of this for you, quickly and efficiently. They also provide professional security monitoring with every system, giving you true emergency protection. What if I want to install my own smart home security system? You can. Several of our service provider partners specialize in self-installed smart home security systems. They’ll configure and test your system before shipping it to you, ensuring an easier DIY installation. You’ll still enjoy dedicated customer support and the assurance of professional monitoring. Every system is different. The size of your home, the scope of your system, and the service provider you choose are all factors. The big advantage, though, is that systems are typically sold with a low upfront cost, then a monthly service fee. It’s similar to paying for a cellphone. Want to include other smart home devices, like smart locks, video cameras and an Energy Star certified smart thermostat? Our service providers carry a huge range of fully-integrated smart devices. They’ll factor your extra devices into the price and install them at the same time. With everything working together, and no need to spend thousands of dollars upfront, it’s the easy way to upgrade your house with smart home technology. Alarm.com is compatible with leading home security hardware brands including DSC, GE Security, Interlogix, Qolsys and 2GIG. Many older systems can also be upgraded. 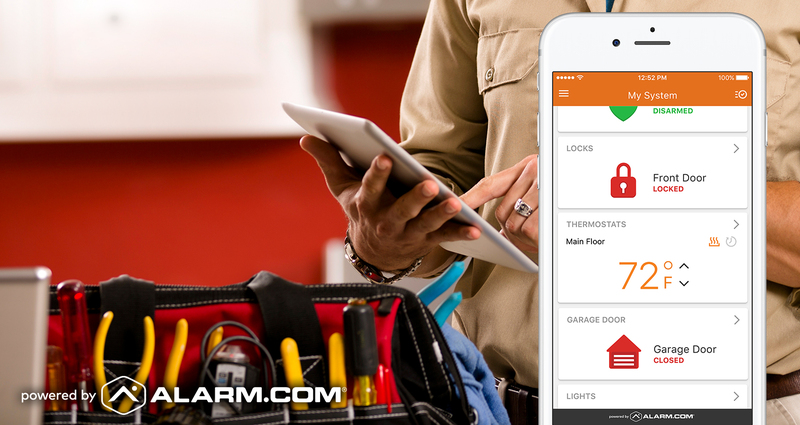 Your service provider can assess your home’s existing equipment and help you identify the best way forward. Absolutely. Click here to get connected with a service provider today. You’ll see a selection of service providers that match your needs and location. Just specify the type of system you’re interested in, add your contact details, and choose who you’d like to receive a call from. Your service provider will do the rest. With Alarm.com, it’s easy.